(Bloomberg) -- The European Central Bank has signaled it may relieve banks in the region of some of the costs arising from negative interest rates. That wouldn’t necessarily boost their earnings, though. Germany’s Commerzbank AG and Deutsche Bank AG -- as well as lenders in France -- would be the biggest winners if they were no longer charged for some reserves held at the ECB, according to analysts at Goldman Sachs Group Inc. However, those benefits could be offset if the measures keep interest rates lower for longer, Citigroup Inc. says. The ECB charges banks for overnight deposits to encourage them to lend money to companies and support economic growth. After five years of negative rates, the costs are mounting for cash-rich lenders, and the central bank is looking at ways of mitigating the side effects. 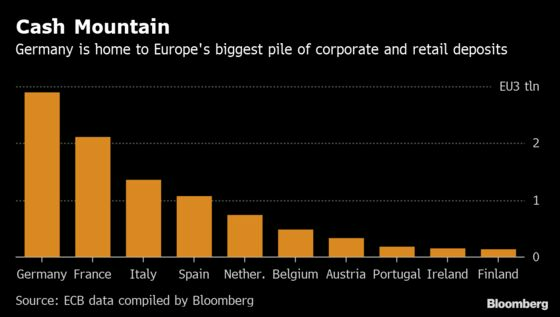 At stake is a chunk of more than 7 billion euros ($7.9 billion) that banks pay the ECB each year to park almost 2 trillion euros of excess liquidity. Since northern European banks are heavy on deposits, they are the hardest hit. Commerzbank alone faced a 277 million-euro gross burden at its two main units in 2016, the last year for which it published the data. ECB staff are examining the issue of tiering, where some of banks’ excess reserves are exempt from the lowest rate. However, there’s no guarantee they’ll take any action, said Peter Praet, the central bank’s chief economist. The ECB has previously discussed such a measure, and said in 2016 that it had decided against it. Banks responded to negative rates by passing on at least some of the costs to corporate clients and lowering the interest paid to retail customers. Any relief from tiering would probably be limited because corporate clients may demand a better return on their deposits at banks, according to Nigel Myer, a credit analyst at Commerzbank. To be sure, the ECB’s efforts to push down borrowing costs have benefited many banks as well as the broader economy. Net borrowers from the ECB -- like banks in Italy and Spain -- are relative losers from tiering because it could drive up costs for them, according to Citigroup. Still, their pain -- as well as the gain for German lenders -- could be offset by a new round of generous loans from the ECB, the analysts said.